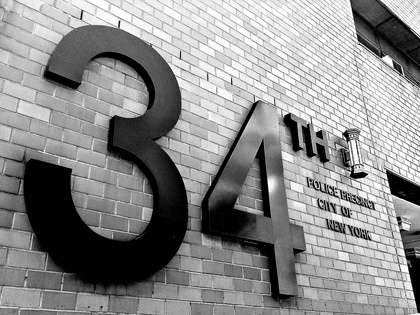 The New 34th Precinct was constructed amongst a conglomeration of high-rise apartment buildings and gas stations. Upon commencement of the excavation we immediately encountered an unforeseen concealed condition. PMS has always stressed that it is vitally important to collect subsurface data from borings which accurately indicate the subsurface conditions. The New 34th Precinct supplied boring data was not accurate. The supplied data indicated loose soil and subsurface water conditions for approximately twenty feet from existing grade down. This did not prove accurate since we immediately encountered a rock ledge almost at the surface. This condition forced an extensive redesign of the basement level of the building. Despite this delay at the start of the project, we were still able to regain enough time during construction to bring the project in within weeks of the originally specified completion date. The construction of the 34th Precinct consisted of a new three story twenty thousand square foot structural steel and masonry building. PMS was aboard from pre-construction through final completion. PMS’ responsibilities included the coordination of multiple prime contractors in conjunction with the New York City Police Department and the Department of General Services. Included in the scope of this project was the transition of the New York City Police Department personnel from the old 34th Precinct Station House to the New Station House.